At CapeRay we follow the standard scientific approach, where a healthy dose of skepticism always demands an answer to the question: Where’s the evidence? A careful and thorough review of the research literature at the time, utilizing tools such as PubMed and Google Scholar yielded nothing. However, a more recent search indicated that Mohamadi submitted an application to the United States Patent and Trademark Office entitled “Handheld and portable scanners for millimeter wave mammography and instant mammography imaging.” Released on 10 March 2016, this patent application describes, in detail, how the prototype scanner works, while some preliminary data are also presented. 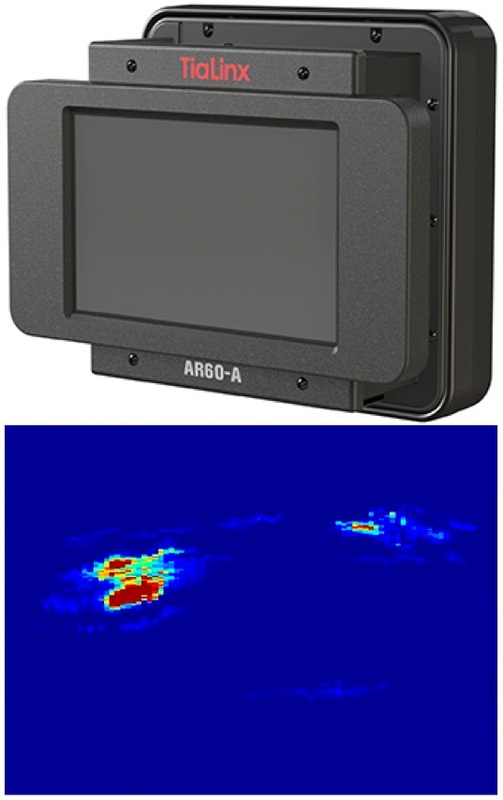 In contrast to traditional X-ray mammography that exposes the patent to ionizing radiation, this new system uses a miniaturized array of ultra-wide band (UWB) radio frequency sensors operating at 60GHz. A cluster of transmitter and receiver antennae, together with polarization techniques and the increased bandwidth of UWB detection, means the whole breast can be scanned from a distance of just 150mm with depth penetration of at least 40mm. Apparently, the electro-magnetic properties of materials – in particular dielectric properties such as permittivity – exhibit a significant contrast between normal and malignant tissues. Moreover, there is no need for the woman to remove any clothing. The evidence to demonstrate the system works is based on two sets of experiments: phantoms that simulated a breast with lesions (see patent drawing above); and laboratory mice, one with lymphoma in the neck region. Although obviously not conclusive, the findings do appear to offer some promise. The final statement in the patent abstract states “this cluster of transmitter and receiver antennae elements improves detection in deeper parts of the breast and can detect cancerous cells in dense breasts often not picked up by mammography.” So, has Fred Mohamadi of MamoMedix discovered the Holy Grail of breast cancer screening? Time will tell, but he will have to publish an article in a recognized journal with convincing results from a clinical trial based on real patients. He will have to publish an article in a recognized journal with convincing results from a clinical trial based on real patients. You made a literary slip (Para 3): ” ……that exposes the patent to ionizing radiation…”. Actually it was not a literary slip, but a profound observation. All unpublished and unpresented work submitted for patent should first be submitted to deep interrogative ionising radiation. Thanks for your feedback, Ian and David. I had a smile when I read your commentary, David! It’s always good to have your insights.